Erosion Protection of Embankment in Allahabad Bypass. Installation of Asphalt Overlay Fabric in Chakdah-Bongaon Port Connectivity Highway. Erosion Protection of Embankment in Indore Bypass. Slope protection with Coir Geocells at Kohima, Nagaland. Sub-base reinforcement of runway in Runway Extension Project of Kolkata Airport. Drainage and Erosion Control on the slope of Red Mud Pond. Prevention of Clogging and Choking of infiltration gallery of Water Intake. 2. Hindustan Construction Co Ltd.
Slope Protection in Subansiri Hydro- Electric Power Project, A.P. Trench Drains in Sagardighi Thermal Power Project. 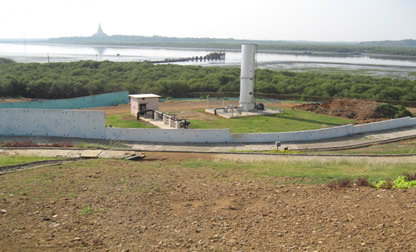 Stone Dust containment filter in Seoraphuli-Tarakeswar Railway Line.